In this episode, Taiki and Yuu recognize every problem with Tagiru getting involved with the Hunt. They let him anyway. Beyond everything going on with DigiQuartz, Quartzmon, the watchmaker and all the trans-dimensional hijinks that happen later, a much more subtle mystery involves Taiki. So far, we haven't seen anything out of Tagiru suggesting that he has what it takes to be an effective partner to his Digimon and fulfill the obligations that come with the job. It's fair to question everything from his innate ability to his mentality to his intentions. So why is it that Taiki, who most certainly does have the right stuff and understands the game better than anyone in the Xros Wars universe, is able to trust Tagiru with such confidence? The ultimate outcome of all of this is irrelevant. Tagiru will come through for Taiki in the end, albeit in a roundabout, not-so-satisfying way. But did Taiki see all that coming? When first confronted with the sight of Tagiru with a Xros Loader, Taiki seemed concerned. He had to know what Tagiru was like, and Shoutmon has similar misgivings about Gumdramon. But even after hearing the gruesome details about the Hunt, Taiki simply returns the Xros Loader and encourages Tagiru on. Taiki's tactical game may be strong, but he's never had the broader perspective of somebody like Daisuke or Taichi. Many of Taichi's smarter moves couldn't be appreciated without taking a step back or viewing them in hindsight. Daisuke's actions tended to look foolish immediately but paid off in the long run. That's sort of place Taiki would be at regarding Tagiru, but it's hard to buy. We're left with the possibility that Taiki is making a serious error in judgment, especially when compared to Yuu. Or there's a third possibility- a front. 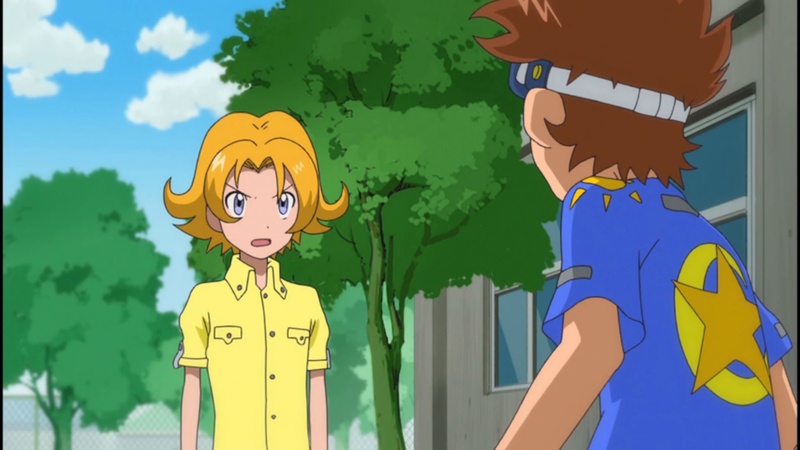 Taiki doesn't know how long it will take Shoutmon to materialize in the human world. Meanwhile, Digimon are getting into DigiQuartz and endangering themselves and/or humans. 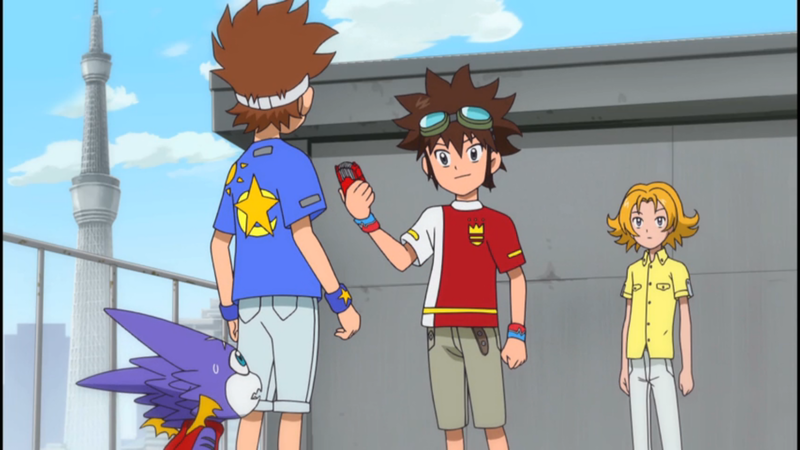 Realizing that kids like Ryouma are involved with their round-up, Taiki has no choice but to trust Tagiru. But rather than showing the kind of skepticism Yuu does, Taiki wants Tagiru to do the job with no reservations, even if he knows Tagiru has a terrible sense of discretion. It's not ideal, and in reality Taiki may hate the situation, but he realizes it's the only way Tagiru will function, and it also makes Tagiru more likely to listen to senpai. A false trust also explains Taiki seeking out the watchmaker on his own and learning as much as he can about the Hunt. No matter what Taiki's mentality, he's taking a serious gamble on Tagiru. Hopefully he knows that. While Taiki either trusts or pretends to trust Tagiru, Yuu vehemently objects. Yuu's biggest issue is Tagiru's enthusiasm for hunting and capturing Digimon. His efforts to use his personal experience to explain what's wrong with this mentality are mostly ignored, although that's because Tagiru discovered a missing kid in his last romp. Never mind that Tagiru learned first hand how the Digimon in DigiQuartz are serious threats that play for keeps; someone's in trouble and he needs to help. It's one of the most pivotal conversations Yuu needs to have with Tagiru, but circumstances conspire against him and make Tagiru in the right this one time. No wonder Yuu's so frustrated that he even questions whether Tagiru is being honest, as if he'd make up something like that. Although Yuu helps the rescue in his own way (namely the part involving actual rescue), Tagiru is totally dismissive of him and his original contributions to Xros Heart. To him, Yuu doesn't have a Digimon and therefore should stay the hell out of the way (given why he doesn't have a Digimon, Yuu absolutely should have punched Tagiru in the face). This may help explain why Taiki goes all out to help Tagiru capture Sagomon, pulling out OmegaShoutmon and a digixros he never needed in the first war. He's making it clear who the boss is, and that he will help Tagiru so long as he recognizes who is superior. Tagiru is left with an immense respect for Taiki even if he disregards everybody else. These Xros Loaders have a few new features like scanning tools and a stronger holographic visual display. Thing is, Taiki seems to know his way around them. Was he aware of the OS upgrade and played around with it in the interim? There is no explanation for the rule about only having one Digimon out at a time and there really needs to be. If it's the way the watchmaker designed the Xros Loaders, Taiki would be exempt. If there was some limitation in the human world or Digiquartz, it should have applied to the previous arc. Gumdramon is fully aware of the digixros process and even explains it to Tagiru. But Taiki's the one that has to walk him through it like it has some complicated mechanics and isn't just a bunch of shouting. One of the unusual quirks of the Xros Wars universe is that it's the only time we see Digimon age. Three years between Adventure and Zero Two (and another three between Zero Two and tri.) and the Digimon there look about the same. One year as king and Shoutmon looks like hell with a cape. All of the kidnapped kids seemed to have very real problems. Nobody talks to them. Nobody asks if they're all right. Sagomon just takes them when they want to disappear and Yuu just rescues them. Yet somehow they all seem to be a little more encouraged and rejuvenated. This makes absolutely no sense. Even if they remembered the experience, it wouldn't have changed anything. Their lives are still miserable... they just may choose to word their grievances a little differently next time. 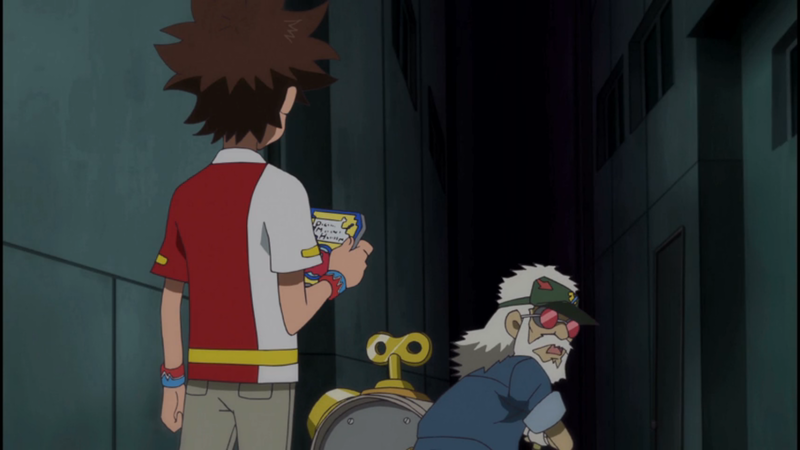 Xros Wars Episode 55: We Are Digimon Hunters! Fusion Episode 51: Rotten to the Digi-Core!